Welcome! The lobby of the Deranged L.A. Crimes theater is open! Grab a bucket of popcorn, some Milk Duds and a Coke and find a seat. 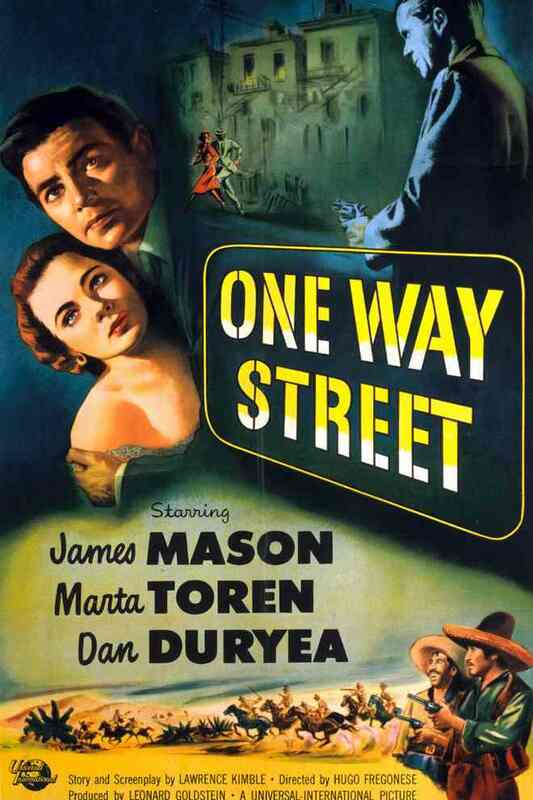 Tonight’s feature is ONE WAY STREET starring James Mason, Marta Toren, and Dan Duryea. Enjoy the movie! After a bank robbery, Dr. Frank Matson waits with gangster John Wheeler, Wheeler’s lover Laura and his henchmen, for the rest of the gang to arrive. Wheeler sends Laura to ask Matson for medication for his headache, and after giving Wheeler some pills, Matson calmly picks up the medical bag containing the proceeds of the robbery and starts to leave. Laura asks to come along, and Matson tells Wheeler that the pills he swallowed contained poison. After promising to telephone him with the antidote, Matson and Laura drive away. This entry was posted in 1950s, Film Noir Friday and tagged 1950, Dan Duryea, James Mason, Marta Toren by Deranged. Bookmark the permalink.